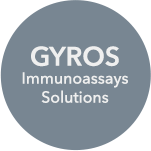 Formed by the merger of Gyros AB (founded in 2000) and Protein Technologies, Inc. (founded in 1985), Gyros Protein Technologies AB is a leading provider of solutions for peptide synthesis and bioanalysis. Our focus is on helping scientists in academia and industry to increase biomolecule performance and productivity in research, drug discovery, pre-clinical and clinical development, and bioprocess applications. The Company combines Gyros’ nanoliter-scale immunoassay expertise with Protein Technologies' -over three decades of instrument manufacturing knowhow and scientific knowledge in peptide synthesis. With an expanded global presence of the combined Service and Sales organizations, Gyros Protein Technologies has an even stronger commitment to supporting our customers around the world to accelerate the discovery, development, and manufacturing of safer biotherapeutics.